Today, the Appalachian Mountain Club’s Highland Center occupies the site of the Crawford House. The above two photos of the Crawford House site were taken 105 years apart. Not much remains of the historic resort, but some remnants of it are in plain view. Gibbs Brook, named for J.L Gibbs, an earlier proprietor of the Crawford House, supplied water to the Crawford House. And just above where the Crawford Connector crosses Gibbs Brook, at its junction with Crawford Path, the abandoned dam (above) can still be seen in the brook. When Crawford House management rebuilt the dam in the 1960s (could have been late 1950s, the date is not clear), they reinforced the dam with old iron cots that were in the basement of the Crawford House. The iron cots can be seen in the dam today. What a great use of bed frames! 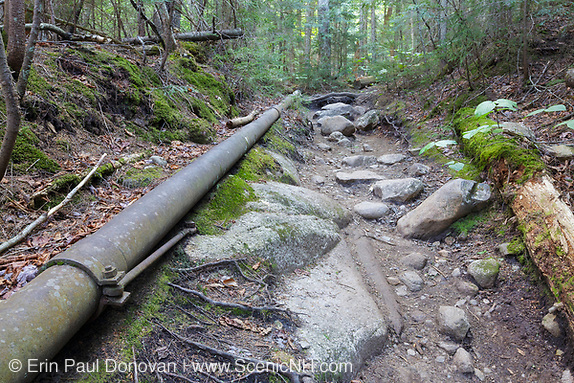 Along the lower section of Crawford Path is the old piping system that ran from the dam down to the Crawford House. Hikers hiking the Crawford Path, the oldest continuously used mountain trail in America, get to see firsthand remnants of the grand resort days. The pipe (above) is anchored down in places. In 1911-1912, the United States Geological Survey built a number of stream gauging stations in the White Mountains. These stations where used to determine the effects of deforestation on streamflow. The results from these studies showed that cutting trees from the forest affected streamflow. 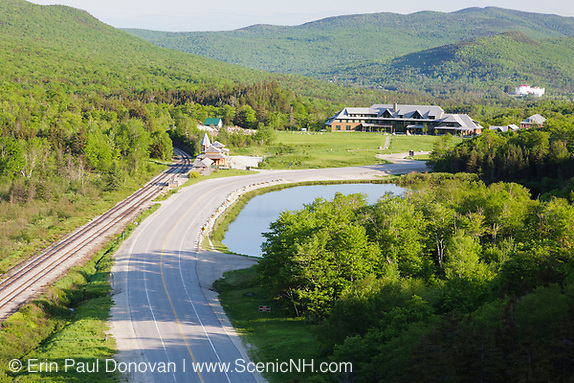 And ultimately helped in the creation of the White Mountain National Forest. 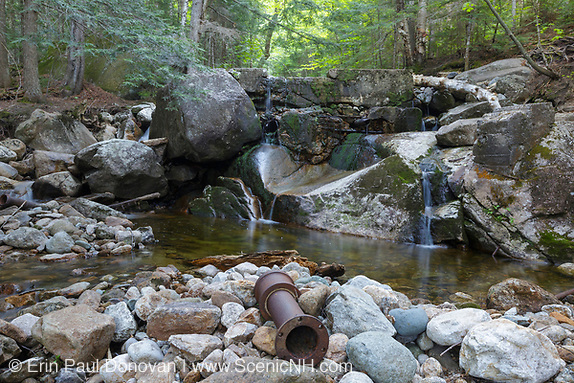 The Gibbs Brook dam site is likely the location of the gauging station that was on Gibbs Brook. Above is the gauging station in October 1911. 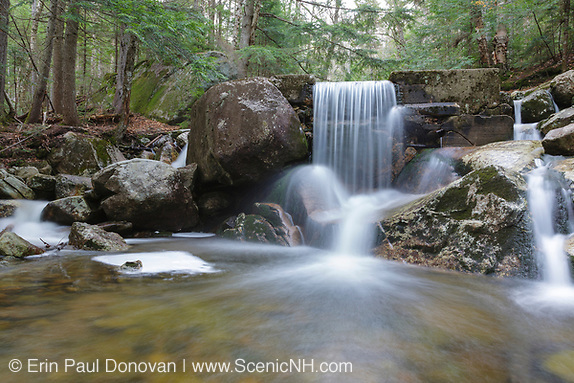 After heavy rains and during the spring snowmelt the Gibbs Brook dam becomes a picturesque waterfall. It is a unique scene that showcases man’s interaction with nature during the grand resort days. 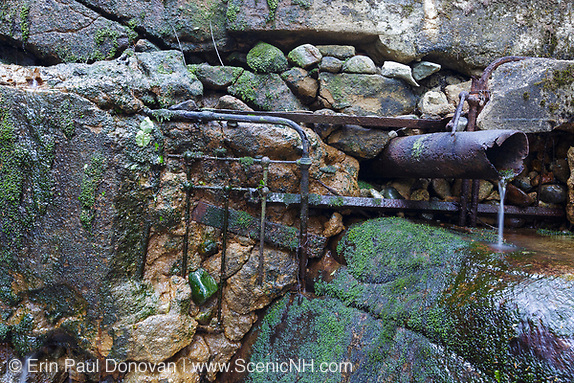 If you are visiting the scenic Gibbs Falls, it is worth visiting this forgotten piece of White Mountains history. To license any of the color photos in this blog article for publications, click on the photo. And you can view more scenes from Gibbs Brook here.